Last week delved deep into the history of the UEFA Intertoto Cup by reminiscing about KAMAZ’s deep run into the competition in 1996. It was the first year that post-Soviet clubs took part in the competition and among the many teams that were trying to qualify for the UEFA Cup was also Ataka Minsk in from Belarus. In fact, Ataka Minsk is just one of the many names the club used from its foundation in 1986 to its disbandment in 1998. In the 12 years of its existence, Ataka Minsk was known as Ataka-407 Minsk from 1986 to 1993, Ataka-Aura Minsk from 1993 to 1994, Ataka-Aura-d Minsk from 1994 to 1997, once again Ataka Minsk in 1997 and then Ataka-407 Minsk in 1994 before finally being dissolved in 1998. The club not only went through several name changes in its brief history but also experienced the full up and downs of playing in the post-Soviet Belarusian league of the 1990s. Created in 1992 the Belarusian top division involved 15 clubs — a staggering number given that Dinamo Minsk was the only club from Belarus to ever play in the Soviet Vysshaya Liga. Hence, the original Belarusian Top Division was made up of one Soviet Vysshaya Liga club, four clubs from the Soviet Second League West (third division), one club from the Soviet Second League B Zone 6 (fourth division). The reminder came from amateur competitions with nine clubs from the Belarussian SSR Top League (the top amateur league) and one club from the Belarusian SSR First League (Belarus’ second tier amateur competition). Belarus had always been one of the least developed Soviet republics. 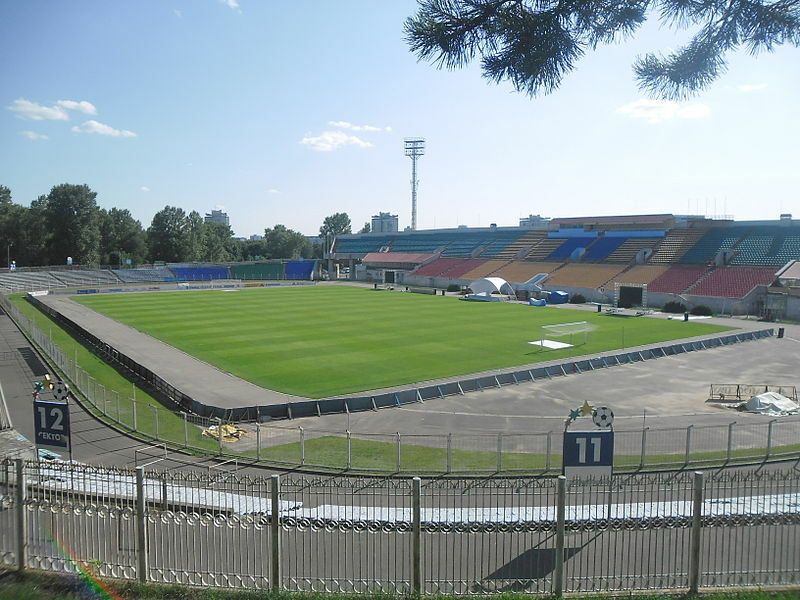 Mostly an agrarian state with just one major city centre in Minsk this was also reflected in its football culture. Most clubs that emerged following the collapse struggled as they were simply not built for top level football. In fact, Belarus became the breeding ground for new football projects. Some like BATE Borisov, who were founded in the 1980s, were hugely successful, others, however, were not that lucky. The rise and decline of several football “projects” that sprouted up like mushrooms in the Belarusian forests is well documented on the Belorussian homepage PressBol. Among the clubs founded and disbanded are exotic names like FanDOK Bobruisk, Dinamo-93, which acted as Dinamo Minsk’s farm team in the first division, Stroitel’ Minsk Oblast, Torpedo Kadino and Partizan Minsk, whose story has been documented on the Futbolgrad Network. Ataka Minsk is also listed on the page. Founded by Yakov Shapiro, who was only 25 at the time of the club’s foundation in 1986 the club was built on the foundation of a successful youth academy with the goal to produce its talent. It was a strategy that worked for some time. Starting life in the 1993 Belarusian Third Division Ataka Minsk had reached the top flight following the 1994/95 season. Then in 1995, the club finished fourth, which qualified the Belarusians for the UI-Cup in 1996. Drawn in a group with Rotor Volgograd, Basel, Atalyaspor and Shakhtar Donetsk it was the closest that this small Belarusian club would ever get to the big times. Not surprising Ataka Minsk struggled in the first game of the UI-Cup losing 0-4 at home to Rotor Volgograd on June 22, 1996. One week later, however, Ataka Minsk shocked the Ukrainian side Shakhtar Donetsk. Shakhtar at that point were still aeons away from becoming one of the most successful clubs of the post-Soviet space, but Ataka’s 2-1 victory on the road at the Shakhtar Stadium was a surprise nonetheless. Unfortunately, for Ataka Minsk it would remain the only upset of the competition. A 5-0 hammering against Basel followed a 3-0 defeat to Antalyaspor. The UI-Cup would be the only highlight of the club’s brief history. In 1996 Ataka Minsk finished sixth in the Belarusian Top Division and the following year would be disbanded after finishing 12th. But as PressBol points out the club did not completely dissolve into oblivion. Twelve of the club’s most promising youth players would join BATE Borisov in what became the foundation of one of the biggest dynasties in Belarusian football.